A Container is an object created to hold other objects that are accessed, placed, and maintained with the class methods of the container - queues, sets, lists, vectors, and caches all fit this description. These objects - the elements of the container - are usually allowed to be of any class and may be of the container class itself. 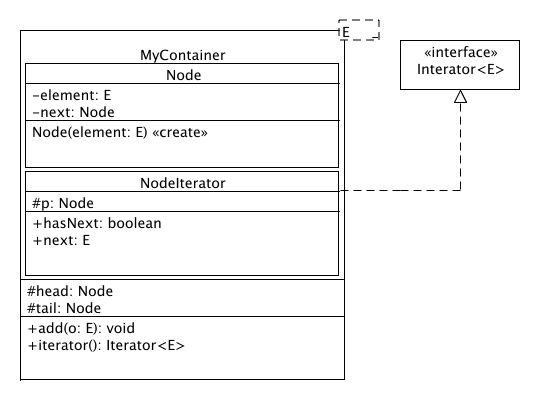 Every Container should also have an associated Iterator type that can be used to iterate through the elements of the container. Java programmers tend to call these types of classes "collections" rather than "containers". The Java Collections Framework provides implementations for many kinds of container classes, a typical implementation of a collection class in Java would be ArrayList or Hashtable. Within the Spring Framework containers represent much more higher level concepts such as inversion of control (IoC). See dependency injection for a sample implementation of IoC. Enterprise beans are software components that run in a special environment called an EJB container. The container hosts and manages an enterprise bean in the same manner that the Java Web Server hosts a servlet or an HTML browser hosts a Java applet. Dependency Injection is a high level implementation of the inversion of control pattern which uses containers. A Container Pattern should really make use of the Interface Pattern, in our short example here we won't implement an interface because we want to concentrate on how a container works. Please note that if you need to create your own container, which is very rare anyway since the Java Collections Framework is quite good, you should implement the Collection interface (public class MyContainer<E> implements Collection<E>) in order to make your container compatible with the Java Collections Framework. // cont_cont.add(string_cont); This does not work -> MyContainer<Integer> ! .println("Integer Container inside Container Container: "